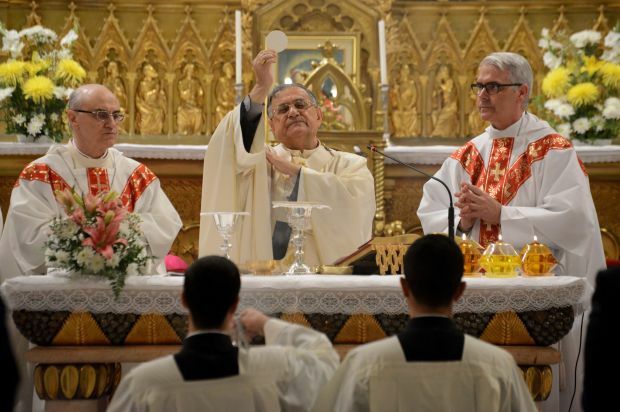 JERUSALEM (CNS) — Catholic Relief Services’ work in the Holy Land has been an authentic expression of the Christian faith, encouraging a love of God and a move to action, said Latin Patriarch Fouad Twal of Jerusalem. “Your work and commitment invite us to reflect more deeply on the experience of God’s love and open our hearts to solidarity with our neighbors and moves us to action,” he said at a Jan. 15 Mass of Thanksgiving celebrating 50 years of CRS’ presence in the Holy Land. Patriarch Twal said he gave thanks to “the all-wondrous God” who allows for the faith with which CRS does its work, noting that CRS is known for its effective and innovative program all over the world. CRS, the U.S. bishops’ international relief and development agency, was created in the wake of World War II to help displaced people. In 1961 the Jerusalem office was established with the help of the Hashemite Kingdom of Jordan, which then had sovereignty over East Jerusalem. Patriarch Twal noted that, 50 years later, CRS was helping Syrian refugees in Jordan. Over its years of service CRS has moved from emergency response and direct feeding to building partnership capacity, said Oklahoma City Archbishop Paul S. Coakley, recently elected CRS chairman. Its work is ever-evolving, dependent on the needs and changes in the communities that the agency serves, he said, noting that CRS continues to provide emergency response when the need arises. Bishop Richard E. Pates of Des Moines, Iowa, chairman of the U.S. bishops’ Committee on International Justice and Peace, noted the role CRS has played in creating connections and dialogue between Christian and Muslim Palestinians. He said the agency also was creating dialogue between Palestinians and Israeli Jews. “It shows that CRS is really there to serve the needs of the people — their physical needs but also in addition their spiritual needs,” said Bishop Pates, who attended the Mass and reception with bishops from Canada, Europe and South Africa who were in the Holy Land on a solidarity visit.